Angela Merkel was born in the D.D.R., the Communist portion of Germany in 1954. Her biography says she was born on July 17, 1954, and that she is the daughter of a Lutheran minister from an East German-controlled church. Recently, however, Soviet KJB archive files reveal an entirely different story. Stasi GDR files indicate that she was born on April 20th, 1954, and details of her birth were included in the records of the German Dr. Karl Klauberg, who was one of the Nazi â€œdeath doctorsâ€� convicted by Soviet courts and imprisoned. When he later was recognized as a brilliant scientist, he was released after seven years and was recognized as the father of artificial insemination. The Soviets were even more intrigued when they discovered Dr. Klauberg had preserved frozen samples of the sperm of Adolf Hitler. Some say it's Andrea Merkel. Could be very fantastic propaganda of course but since truth is often proven to be stranger than fiction, heck... who knows? But a fantastic story either way not entirely impossible which makes it fun. Obviously she is too ugly & stupid to be my child. See? Knew you didn't commit suicide in BERLIN. So, shouldn't you be posting in Portuguese? Well I only speak German and English. I spent time in England as a child. People think that I spent time hiding in the jungle, but Operation Paper Clip gave me much better accommodation. A new biographical book to be released by historian Ralf Georg Reuth titled â€œThe First Life of Angela M.â€� reveals the E.U. politician Angela Merkel played a far greater role in the communist East German establishment than ever imagined. According to research by Reuth, Merkel was a professional cadre in the Communist Party of East Germany, where she worked for the Academy Of Science and held a leadership position in charge of the mobilization and propaganda of the Communist Youth League since 1981! The historical investigators in charge of this groundbreaking biography even stated in an interview: â€œAngela Merkel was much closer to the system of East Germany than believed so far and we can prove it. â€� Merkel is also revealed to have taken certain dogmatic views on the future of Germany. She used her position in the Communist party to publically denounce re-unification of Germany and the bringing down of the Berlin Wall. In other words, the ex-communist-now-plutocrat opposed the existence of the very nation she rules today. When the Berlin wall fell in 1989, the Bolshevik fanatic Merkel transformed her image and began looking to utilize the new united Germanyâ€™s conditions. She went on to help establish a new movement that sprang in East Germany, called â€œDemocratic Awakeningâ€� with Wolfgang Schnour and the first prime minister in the ex-communist East Germany Lothar de Maiziere. What did Schnour and Maizere have in common? Both were found out to be paid agents of the Stasi, responsible for the terror, torture and deaths of thousands. The book also confirms statements of the leader of the East German Communist governmentâ€™s successor party, Die Linke (the Syriza of Germany) Oskar Fontaine, who stated that Mrs Merkel played a significant role as a professional propagandists for the East German Young Communist League. Both the German and Greek media have curiously, with some sterling exceptions, blacked out these new revelations about Angela Merkel. The media is deliberately obscuring the facts so that those who speak so selectively about â€œhuman rightsâ€� while doing inhumane things do not have to answer about their past. Merkel has gotten her lackeys to say that those inquiries about her past should not be answered. I refuse to pay child maintenance. In 1954, a child was born, a baby girl, whom the Stasi File identifies as Angela Merkel, today?s Chancellor of Germany. Her official birthday is July 17, 1954. However, the Stasi file which is currently in the Soviet KGB archives, records her birth as April 20, 1954. 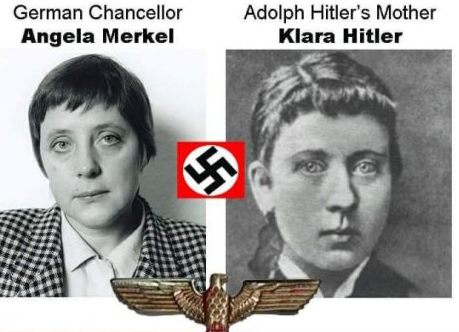 If this secret police citizen?s file in the Ministerium f?r Staatssicherheit (GDR) is correct, then Hitler?s daughter, Angela Merkel, was born on Adolph Hitler?s birthday ? April 20? Klauberg was classified as one of the worst Nazi ? Angel of Death ? doctors and was? released by the Soviets? in return for turning over to the KGB? the frozen sperm of the former Nazi Dictator, Adolf Hitler. Hitler?s father, who took the name Hitler, was the illegitimate son of Solomon Rothschild?s mistress Anna Maria Schicklgruber. Upon receipt of the Nazi files on artificial insemination, along with Hitler?s frozen sperm, the Soviet Politicheskoye Buro (Politburo) authorized the experiments to ?resurrect?, ?if possible?, a child bearing the ?genetic markers? of Adolph Hitler.